The favourites to win the 2017/18 edition of the UEFA Europa League, Atletico Madrid, are matched up with Sporting Lisbon in the tournament quarter-final, set to be played on April 5th and 12th. The first leg of the tie will be played at the new Estadio Metropolitano in Madrid. Both Atletico and Sporting started the season in the UEFA Champions League, where they have been a steady presence in recent years. Atletico finished third behind Roma and Chelsea in their group, while Sporting had to settle for a place behind Barcelona and Juventus. In the last round of the Europa League Atletico made easy work of Lokomotiv Moscow, beating them 8:1 on aggregate, while Sporting needed extra time to beat Viktoria Plzen 3:2. Domestically, Atletico Madrid are second in the Spanish La Liga standings behind the runaway leaders Barcelona. This makes Atleti that much more dangerous of an opponent in the Europa League, especially considering the strength of their squad, valued at €587m by Transfermarkt. Antoine Griezmann is without a doubt the standout player on the team, which also features international stars such as Koke, Saul Niguez, Diego Costa and one of the top goalkeepers in the world Jan Oblak. Sporting are currently third in the Portuguese league standings, five points from the top and three points from second place. The Lisbon side feature a more modest lineup with forwards Bas Dost and Gelson Martins being the team's most dangerous players. The total squad valuation of Sporting is €195.5m. 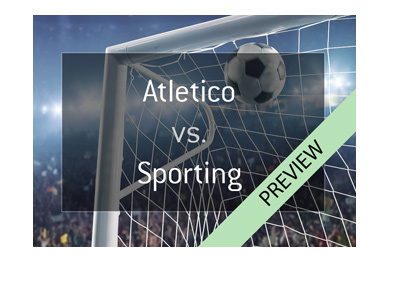 The two-time Europa League winners (2009/10 and 2011/12) Atletico are considered to be the strongest team in the competition and favourites to win this match, progress to the next round and win the tournament altogether. There is not much argument there as this competition is all Diego Simeone's men have left to focus on, considering the title race at home is over and they are out of the cup.